He has had enough and he is ready to do something about. Kelly thinks like you do despite what you will hear when the campaign of this regular American begins to be taken seriously by the mainstream press. Americans today are overtaxed and, just as in 1776, there is no visible representation. The spirit and reality of representative government that enlivened this country following the American Revolution has all but eroded into what we see today: an ad hoc litany of superficial homage to the discarded bedrock of what was once the very foundation of this great country. 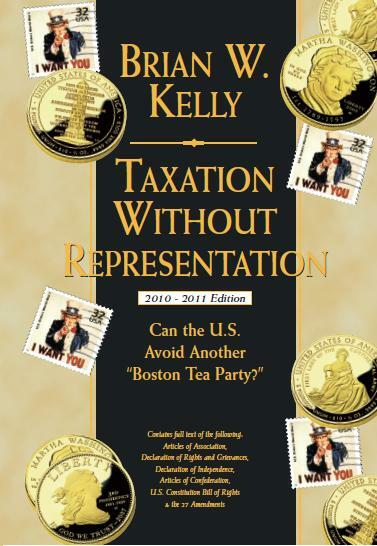 Brian Kelly wrote this book because our representatives in the House and Senate, and in state legislatures and city councils across the nation have forgotten their duties as representatives of the people. Additionally, the President, the governors, the mayors, and other prefects of the people in the executive branches of governments across the land have conveniently forgotten that the primary fundamentals of our representative constitutional democracy start with representation. No single branch of government can claim immunity in the sale and resale of the United States to outside interests and American corporations. Each knows no moral bound or impediment to the gluttonous drive to perpetuate its self-serving two-party system. Even the judiciary is more caught up in preserving the two-party system than permitting deserving independents their opportunity to run for public office. All of the candidates running for president in 2008 called for big changes. They were all right. They struck a chord with the American people on "change," but none offered specifics. Barack Obama came from no place to be the cheerleader in charge and now it is very clear that he is moving the country so far to the left that the center is barely visible. There is no question that there is a lot of substance on Obama's plate right now, but many believe it is the substance learned from his Chicago cronies, including Reverend Wright, Father Pfleger, and the followers of the master of indoctrination and quiet insurrection, Saul Alinsky. Right now, as sad as it may sound, it looks like we are headed down a road from which we may not be able to return. There is an assault on individualism, the Constitution, capitalism, and democracy itself, in favor of socialism and perhaps even Marxism and non-violent Communism. We need only look to England to see how bad it can get in all aspects of life. The irony of the last election is that as the people asked for real change, they counted on skilled politicos, not ordinary people to get the job done. We reap what we so. Most often ordinary people do not run for office. The greatest enemy of a skilled politico is an informed public. An informed public would be very careful about putting a skilled politico in any position of consequence. In the 2008 election season, from which we are still recovering, there were few Americans who had not tuned into the apparent desperate need for change at all costs. It will cost us dearly. We had eight years of an unresponsive presidency with unprotected borders. Our Congress is still fraught with infighting, back-stabbing, and blame games seemingly peeled from the script pages of a discarded low-budget sitcom, except for one thing. After we got the change "we can believe in," most can't believe we got this kind of change. The economy is in the toilet and freedom is being attacked more than any time ever in most of our lifetimes. The result of wishing for, and getting this new administration would warrant humor were it not so dire in its implications. For years, many of the older generation would joke when somebody would complain that Congress and the administration had gotten nothing done. In the Bush years, nothing done was the modus operandi. In the Obama years, it is actually scary how quickly the country is heading left to get things done. There were many jokes in the Bush years that it was good that nothing was getting done since at least it meant that the corporations weren't getting any further ahead of us. With Obama mowing people down regularly wherever he deploys his influence, finding big government as his only answer, we may be soon longing for the days of plain old corporate dominance. Those in power need to be held accountable: No bad actors and no repeat performances can be permitted in the future. Denying repeat performers another opportunity for the stage is a good start. American prosperity has been sold down the tubes as jobs and national secrets and intellectual property have gone overseas and labor arbitrage is the order of the day for non-union workers at home while many union jobs have moved overseas. Five hundred forty-five people have perpetrated these stunts against the American people. You know who they are. In terms of separation of the governmental powers affecting us, there is one President, Barack Obama, heading the Executive Branch. There are nine Supreme Court Justices comprising the Judicial Branch, and there are 535 representatives in the Legislative Branch. The 535 members of Congress are split with 435 House Representatives and 100 Senators. This small number of perpetrators reminds me of the Jerry Lieber / Mike Stoller song, "Is that all there is?" I can hear Peggy Lee singing it in my mind. But the way these 545 have disrrespected and dismantled our country, making it substantially weaker and less American reminds me of a different song by Ray Price and Shirley Jones, "You Done Me Wrong!" And boy did they ever. That is the song I want to get out of my head so that we can begin our recovery from the mind-numbing change of Obama. There are few ordinary citizens better off today than the day Ronald Reagan left office. This country does need change, change for the better, and in his book, Brian Kelly outlines many areas in which we all can make big improvements. Step one begins with full accountability. Though charged with the duty to represent the people, public servants are so overwhelmed with self interests, special interests, the interests of corporations and the interests of other countries that they have no time to work for the people. When you finish reading this book, you will see that the "honorables" are not serving America honorably. "No taxation without representation" was the catch phrase in the period of 1763 to 1776 to summarize the major grievance of Americans in the 13 colonies, incipient kernels of what would later become the United States of America. When King George III of England and the English Parliament began to impose new taxes on the colonists (e.g., Stamp Act, Intolerable Acts, etc.) without their concurrence, Reverend Jonathan Mayhew of Boston coined this term during one of his sermons in Boston. Another Bostonian, a politician by the speak of the day, James Otis, changed this just a bit and he is well known for the phrase, "taxation without representation is tyranny." Tyranny it was and in this book, you will be able to see that tyranny it surely is again. Beware of the lulling idea that your government cannot be taken over by rich members of an owner class or de-facto by corporations, or even by a powerful president and a progressive Congress disdain for capitalism. The quickest way to assure this is to stop caring and to stop voting and to let politicians have their way. Brian Kelly wrote this book because he cares. Together, we hope to energize Americans again as in the 1700s that this magnificent democracy is worth fighting for. Brian hopes you enjoy reading this book and that you will remain vigilant and take the actions necessary that this experiment in democracy, this United States of America, can persevere and succeed for many hundreds and hundreds more years!